Fresh from my local triumph with Leonardo The Musical (Book and lyrics – Robert Duncan. Composers – Gordon Waller and Robin Box. Director Peter Wheeler) and the unmitigated disaster of my attempt to translate this to professional success on the London stage, you would have thought I would never get involved in another theatrical production. Ever. In my life. I lost the value of a small house. But I did. 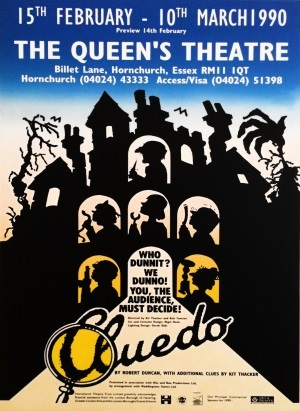 Almost immediately I launched into writing a stage play of Cluedo – bringing to life characters who had never been seen anywhere before. Not on radio, TV, the silver screen or in theatre. I have tried many times to find another group of characters we all know, that haven’t come to our attention via one of these branches of the media. Think of same, and I could write a wise and witty script, we’ll make loads of money and split the difference. So write it I did. A comedy thriller with six alternative endings, that got the local theatre company very excited – to the extent that they took the resulting production on tour, to Henley and Broadway! All right, Ealing Broadway – but it was still pretty good. The show booked up well, was the subject of a really good piece on early evening television, and performed to packed and very enthusiastic houses. On one of those evenings, a theatrical producer called Ian Liston came to see the show. His company, Hiss & Boo, were succeeding enormously, touring several shows around the country and getting him an enviable reputation in all the right heady circles. Ian rang me, we had lunch, I recognised him from Crossroads, and didn’t recognise him from the original Star Wars (a gig he still makes a few bob out of with personal appearances to adoring fans – including my ward Sam, who has a photograph of himself with the great man, in a Storm Trooper helmet) and the deal was done. Lovely Waddington’s were thrilled to give their blessing, and the show went into rehearsal as a Theatre Royal Windsor production in advance of a national tour. To name but a few of the cast, Trevor Bannister was the silly inspector and Christopher Biggins was Reverend Green. I was very busy at the time, trying to pay off the enormous debt I had accrued over the Leonardo fiasco, so the only time I met the cast was at a rehearsal room in Windsor. First night. The Theatre Royal was booked to capacity and many of the most wonderful people in my life had agreed to be there. Lotte Duncan of TV chef fame rose to the occasion and turned up to collect us in a limo, brandishing a magnum of Champagne for the journey. The theatre was emblazoned with posters mentioning my name, and as we settled into our seats I saw the beautiful theatre for the first time. Several mental snapshots come to mind – my parents, God bless them both, were a few rows in front of us. My sister and her lovely husband were getting ready. And, as the lights began to dim, I saw a young girl just in front of me lean forward with a smile and rub her hands. She just about summed up the whole evening – the curtain lifted to an incredible two storey Gothic set and the actors came on spouting my words. The next day we flew off to Barbados and Mrs D no.1 constantly suggested I should ring up to find out how the production was going. I refused. I didn’t want to ruin my holiday. When we got back I found a letter from the Theatre Royal Windsor in my pile of post, informing me that Cluedo had beaten their all-time box office record. As I delved further down the pile I found a second letter – the play had beaten its own record in its second week. Last time I was at the theatre I saw a big panel of photos and memorabilia about the show. Thanks to Ian, that’s probably my biggest footprint in the sand. We’d love to tour the show again – but horrible Hasbro won’t let us. Maybe replacing Waddington’s with someone who says ‘at this time’ three times in one sentence is what this soulless, and no doubt incredibly profitable, company needs. This entry was posted in Latest News on March 6, 2015 by admin.